A view looking north on Briggs Road shows the road closure and work being done to widen the Warm Springs Creek bridge. 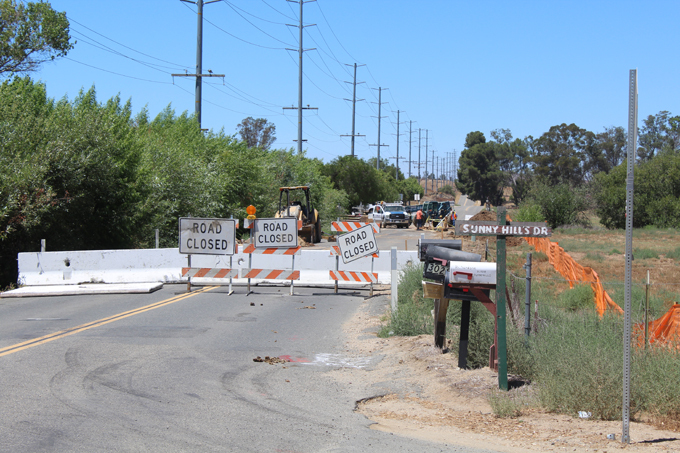 One of the latest signs of progress in the rural parts of Murrieta is the widening of a "country road" that is becoming a busier route between Murrieta and Menifee. Starting June 20, crews closed Briggs Road from Baxter Road north to Scott Road in order to widen a short stretch of road that previously was only one lane crossing Warm Springs Creek. That location is little more than a culvert under the road for drainage during rains, but to many it is known as the little one-lane bridge because of its original narrow width at the dry creek bed site. Briggs Road is a two-lane road from Baxter Road north to Scott Road -- except at the bridge. Previously, motorists traveling north had a stop sign just before the bridge and had to wait for any southbound traffic to clear. Traffic backup on the northbound side will now be eliminated, which comes at a time when the construction of additional homes south of the bridge is increasing. "We're widening the bridge to improve safety," said Dennis Green, a retired CalTrans engineer and now consultant for the County Transportation Department, which oversees the project. "There are two schools right above that hill and traffic becomes a bottleneck." Green said the project was delayed because of issues with the relocation of utility lines during the transition from Verizon to Frontier Communications. The project is expected to be completed by Aug. 31. Meanwhile, only residents are allowed on the closed stretches of road north of Baxter Road and south of Scott Road. 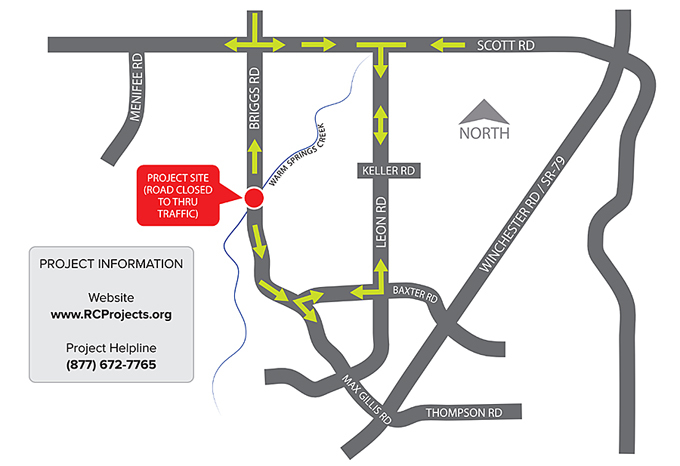 Northbound travelers should detour east on Baxter Road to Leon Road and head north. Southbound motorists should use Leon Road rather than Briggs Road. Map courtesy of Riverside County Transportation Department.